These upper-echelon European improvisers offer a grab bag of tasty treats in front of an audience at the Festival Just Music in Wiesbaden, Germany. This 2015 performance consists of three works, but the 35-minute opener "Drifter," is a tour de force amid a macrocosm of delicate phrasings, succinct shadings, ethereal background treatments and scorching, climactically driven buildups. Essentially, they keep you on the edge. 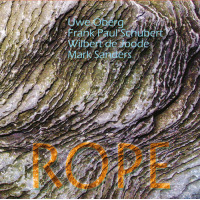 Frank Paul Schubert's darting and weaving soprano sax lines and pianist Uwe Oberg's multifaceted attack help spawn numerous crosscurrents and asymmetrical cadences, complete with the anticipated peaks and valleys, as the alternating subplots include a surfeit of dynamics. 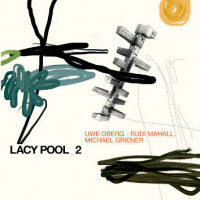 These improvisations are executed with diverse emotive aspects, whether the band is conjuring up an inward-looking vibe or throwing fuel on the fire during frenzied breakouts. They wind it all down, then come back with a vengeance along with Schubert's skittish and rough-hewn flurries and drummer Mark Sander's colorful use of small percussion instruments that augment his drumming duties. Track Listing: Drifter; Skipper; Over. 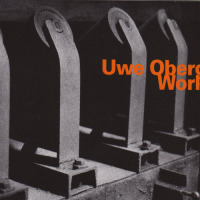 Personnel: Uwe Oberg: piano; Frank Paul Schubert: soprano saxophone; Wilbert De Joode: bass; Mark Sanders: drums.